Barbara Blue is the reigning Queen of Beale Street blues, no question. For the past 15 years, she’s held court five nights a week in Memphis, and has performed or recorded with an impressive list of artists such as Taj Mahal & The Phantom Blues Band, Jeff Healey, Marcia Ball, Delbert McClinton, Maceo Parker, Pinetop Perkins, James Cotton, Steady Rollin’ Bob Margolin, Tab Benoit, Corey Harris, Sean Costello, The Nighthawks, Candye Kane, Zac Harmon, Trudy Lynn, Carol Fran, and Gaye Adegbaloba. 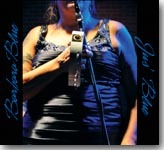 Blue has released eight albums, included a great three-CD live set from Silky O’Sullivan’s (her stomping grounds), three discs backed by the Phantom Blues Band (Sell My Jewelry, Memphis 3rd and Beale, and Love Money Can’t Buy), and a set recorded at the legendary Royal Studios, backed by some of Memphis’ finest musicians (The Royal Sessions). Given that body of work, it’s only fitting that Blue’s latest release is a retrospective, Jus’ Blue (BIG Blue Records), collecting 14 of her best studio tracks, plus four excellent new tracks. There are two remastered tracks from her debut recording, Out of the Blue, a rocking “No No Baby,” and the slow blues, “What To Do,” that show she’s was a pretty formidable talent even dating back to its 1994 release. Half the disc consists of her recordings with the Phantom Blues Band (Tony Branagel – drums, Larry Fulcher – bass, Johnny Lee Schell – guitar, Mike Finnigan – keyboards, Juke Logan – harmonica) and the Texicali Horns. These tracks showcase Blue’s versatility as she ably handles blues, soul, blues/rock, and funk. Blue’s most recent studio effort was the session at Royal Studios that included backing by the late Skip Pitts, Preston Shannon, Lester Snell, Robert “Nighthawk” Tooms, Steve Potts, and David Smith. Produced by Willie Mitchell’s son, “Boo” (the elder Mitchell was slated to produce, but passed away before recording began), these three tracks represented here rank with Blue’s best work, and obviously she agrees, since she returned to Royal to record the four new tracks for this collection. “Sweet Love Blues” is a smoldering remake of the original track that was on her debut release and it was a great choice to lead off the disc. “Mary Jane & Muscadine” and “Handsome Jack” are soul/blues tracks, and “A Woman’s Blues” is a great homage to the Memphis soul of the ’60s and early ’70s. Jus’ Blues is a solid representation of Barbara Blue’s body of work to date, but you will be hearing more from her in the future.